Vidalia is thrilled—this summer, she's headed to Paris. And as if it weren't enough to simply be there, she'll be studying under the famous artist and teacher, Laurent Benoit. Despite her reservations about leaving her mother alone for six weeks, she sets off, excited for what her visit will bring. Once in Paris, she meets two guys—sweet, studious Julien who works at the bookstore Shakespeare and Company, and mysterious Marco, who is impulsive and passionate—and not altogether truthful. Soon Vidalia is caught up in the excitement and wonder of a beautiful city, freedom, and the thrills of first love...but when she finds herself in over her head, will she be able to help herself? One thing that stands out the most in Watson's debut novel is her exemplary use of imagery and her highly descriptive language that brings Paris and the surrounding French countryside to life, lending an air of authenticity to the book that is hard to achieve otherwise. Likewise, Vidalia is a very multi-faceted character whose strong emotions are palpable, and readers will empathize with her conflicting feelings for Marco, her exasperation with her mother, and the hurt of a friendship that seems to have run its course. These convincing and heartfelt feelings, along with Watson's smooth style, make it easier for teens to buy the slightly far-fetched details of the book, like Vidalia and Marco crashing an elite party. However, Watson keeps surprising the reader until the very end with plot twists and turns that you won't see coming without unnecessarily complicating the structure of the story. 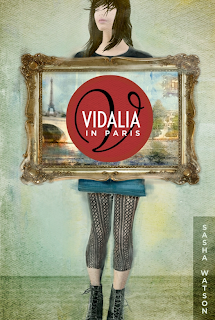 Overall, the Vidalia in Paris captures the beautiful rush of independence, and best of all, the coming of age. I'm right in the middle and I LOVE it! <3 your blog! Thank you so much for this review! I'm the editor of VIDALIA IN PARIS and I just want to say what a pleasure it was to work with Sasha Watson. We both appreciate your kind words. 'Vidalia in Paris' was fantastic! I read it in half a day- couldn't put it down. It's for young adults, but I'm 26 and it's one of the best books I've read in awhile. Congratulations to Ms. Watson! Win a Copy of Francey by Martin Dubow!